Find out some of the secrets of New Orleans' cuisine with this 2-hour cooking class in the French Quarter. Meet in the afternoon at The Old Coffee Pot restaurant for a fun and exciting cooking demonstration with a local chef. Head for The Old Coffee Pot, a restaurant in the heart of the French Quarter, and come hungry - this cooking experience ends with a meal. 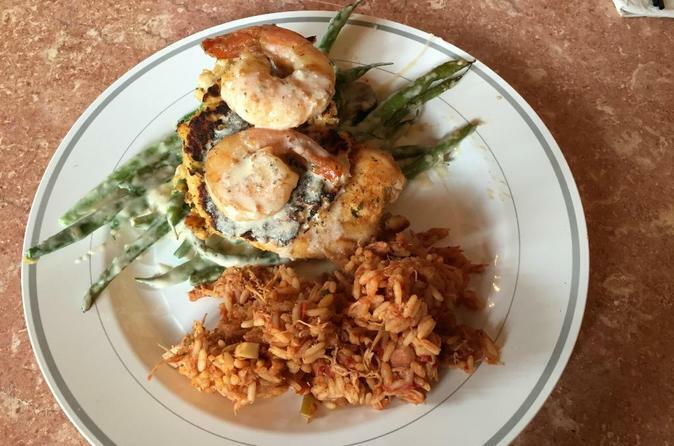 Watch and learn as the restaurant's chef prepares a dish called Fleur-de-lis Chicken, which is a chicken breast topped with Louisiana crab cake and Gulf shrimp. Take photographs, jot down notes, and ask questions to get insider tips on making this dish. During the demonstration, your host will also be providing useful history and context about Cajun and Creole cuisine, cooking techniques, seasoning, and other recipes. After the cooking demonstration, you'll sit down to eat the finished Fleur-de-lis Chicken, served with green bean casserole and The Old Coffee Pot’s jambalaya. The Old Coffee Pot has been serving customers in the French Quarter for more than 100 years, and was also featured on the Food Network’s hit traveling cooking show Diners, Drive-Ins, and Dives with host Guy Fieri. The restaurant's famous Fleur-de-lis Chicken is a tasty combination of everything Guy tried when he visited.